So, MySpace is back… again. The troubled social networker has re-reinvented itself as a, um, social networking platform with new site design, and a continued focus on music promotion. After a couple rounds of closed beta tests, the new site is live now. While I usually believe that solid QA is one of the most important parts of the design and launch process, I have to wonder what new features MySpace could possibly be testing. The splashpage of the revamped site offers, confusingly, a stylish black & white of Justin Timberlake. He’s a shareholder in MySpace (A good tech writer confirms her facts, and this seemed so goofy that I confirmed it via these stores on TechCrunch and The Washington Post. I’m not surprised that Timberlake invested in MySpace — wouldn’t we all throw some of our extra millions into tech projects we enjoy? I’m more surprised that he and his publicists through being connected to MySpace was a good idea. Sure, MySpace was an awesome social site, when making a profile and collecting friends was new, but it spent longer as as musical spam site for struggling bands. The new MySpace offers an option to sign in with Facebook, but even without the hassle of filling out names and information, I’m really curious if any of you are planning to make a MySpace profile, or resurrect your old one. Inside, users can browse through music and musicians, with a lot of the social features of Spotify. Only, as with any social networker, until there’s that critical mass of users, most of social interactions and recommendations can’t function. though, and I wouldn’t even have known the song was out without seeing it on the front page of MySpace, and then getting an easy download link immediately after logging in. 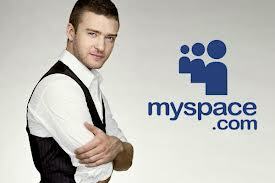 Maybe the whole MySpace relaunch is a marketing vehicle for him! Well played, Justin Timberlake, well-played.